The best books—Our JLG Gold Standard stamp of approval guarantees that all titles delivered to you are of the highest quality. 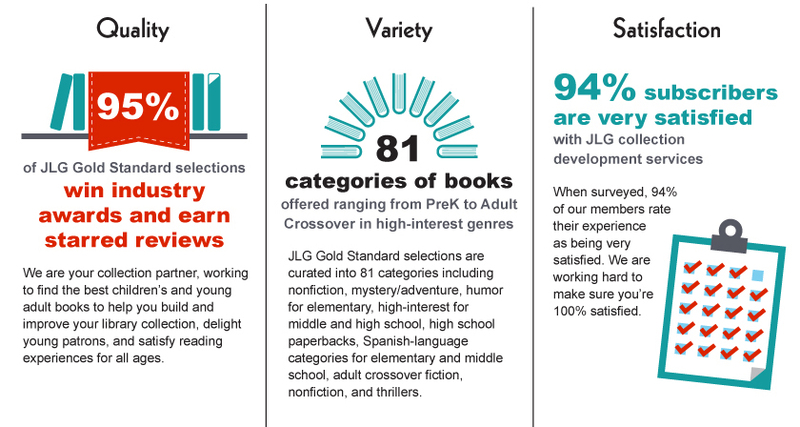 95% of the titles we select for JLG go on to win industry awards and starred reviews. Learn more. The right price—Shape your membership to fit your collection development needs at the budget that works for you. Billed on a single PO, you will receive the newest, best books at substantial discounts. Even at the end of the year when your book budget is spent, your subscription boxes will keep on coming. The most perks—Free shipping, unlimited swaps and substitutions, delayed billing, summer ship holds, customized cataloging and processing, discounts on subscriptions to School Library Journal, Library Journal and The Horn Book, up to 70% off on previously released books, and more.